Primary non-Hodgkins's lymphoma is a very uncommon lesion, accounting for 0.6% in jaws. As the lesions frequently resemble other disease such as chronic osteomyelitis, odontogenic or any secondary neoplasms, further evaluation and histopathologic examination allow early identification for appropriate treatment. 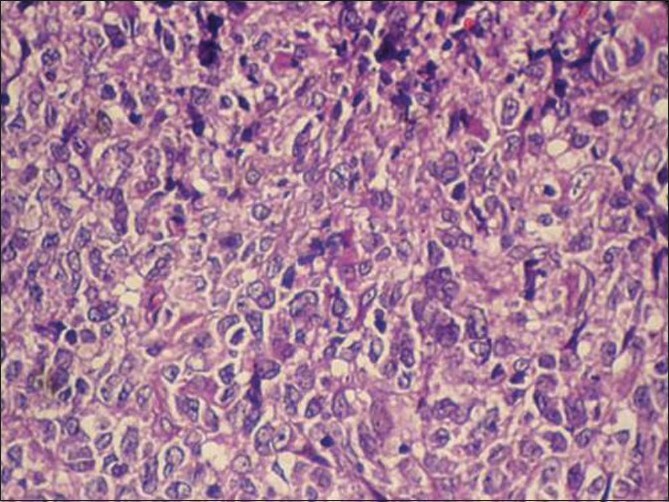 The purpose of this case report is to describe a rare case of non-Hodgkin's lymphoma of the mandible, explore the diagnosis and workup based on immunohistochemistry. Malignant lymphoma is a neoplastic process of the lymphopoietic portion of the reticulo-endothelial system. Most of them originate from B-lymphocytes. Lymphoma is the second common malignancy of head and neck. Primary non-Hodgkin's lymphoma (NHL) of the bone is rare, accounting for <5%, and that of the mandible is 0.6%. In 1963, the term primary lymphoma of bone was introduced by Ivins and Dahlin. The etiology is unknown even though virus and immunosuppression are implicated. The most common manifestation is pain and swelling in the jaw bone, but it is often clinically diagnosed as a dental infection. Hence, the diagnosis of lymphoma in jaw bone is often delayed. Biopsy is considered when there is a non-healing extraction wound and if any extra-oral wound is not resolving for a prolonged period. 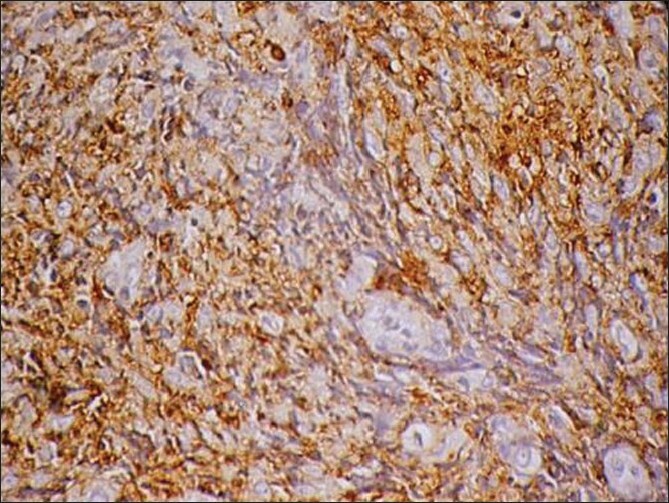 The histopathological diagnosis has to be confirmed by immunohistochemistry. The WHO diagnostic criteria for primary lymphoma of bone are a primary focus in a single bone and histologic confirmation and, at the time of diagnosis, no evidence of distant soft tissue or lympnode involvement. There are no pathognomonic radiographic findings. Paresthesia along the inferior alveolar nerve distribution is a common finding, with reports ranging upto 20%. We present a case with a dental complaint which was later diagnosed as primary non-Hodgkin's lymphoma of the mandible. A 54-year-old male presented with a past history of non-resolving extra-oral swelling on the right of the face. He underwent surgical removal of impacted right mandibular third molar 2 months back by an outside practitioner. He was under antibiotics and anti-inflammatory drug coverage for a few days. Following extraction, the swelling did not resolve and, subsequently, they extracted 47 and 46 presuming some dental infection. On extra-oral examination, a diffuse swelling was noted on the right side of the face near the angle of the mandible [Figure 1]. Intra-oral examination revealed a fleshy mass in the region of 46, 47 and 48. On palpation, the mass was tender [Figure 2]. Medical history was not contributory. Radiographically, minimal radiolucency in the 47 tooth region was seen. Based on the history and examination, a provisional diagnosis of "chronic osteomyelitis" was made. An intra-oral biopsy from the retromolar region was taken. Histopathology showed sheets of atypical lymphoid cells. 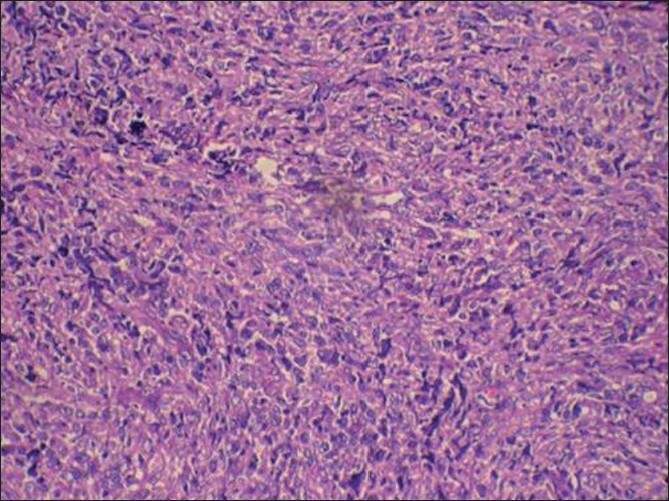 The individual cells were polyhedral with scant eosinophilic cytoplasm. The nuclei showed irregular membrane, open chromatin and prominent nucleoli. Foci of atypical mitotic figures were also seen. The lymphoid cells were seen infiltrating the bone. Areas of sclerosis, necrosis and hemorrhage were seen amidst these cells. Bony trabeculae, fibro-collagenous tissue and neural elements were seen [Figure 3] and [Figure 4]. The immunohistochemistry profile showed positivity for leucocyte common antigen (LCA) (CD 45) [Figure 5] and CD20 [Figure 6]. Based on histopathology and immunohistochemistry, a diagnosis of non-Hodgkin's lymphoma was made. The patient's general health was examined by a physician to find out involvement of any other site. Investigations like hemogram, radiograph and computed tomography (CT) scan were performed and no other site except the mandible showed involvement. Based on all the findings, a diagnosis of primary lymphoma of mandible was made. He was then referred to an oncologist for treatment. Primary bone lymphoma occurs in patients from 1 to 86 years (median range, 36-56 years) of age, with peak prevalence among patients in the 6 th and 7 th decades of life. Our patient was in the 6 th decade of life. Most of the cases initially present as an odontogenic infection. Parrington et al. have discussed a case of primary lymphoma of the mandible presenting after tooth extraction. Leva Dja vonmardi et al. have reviewed 16 cases of malignant non-Hodgkin's lymphoma of the jaws and found that diagnosis that was usually difficult and was often misleading and delayed before the first bone biopsy. Our case also demonstrated diagnostic difficulty by the dentist. Even the radiograph was not contributory to suspect a malignancy. There was not much of lytic destruction. 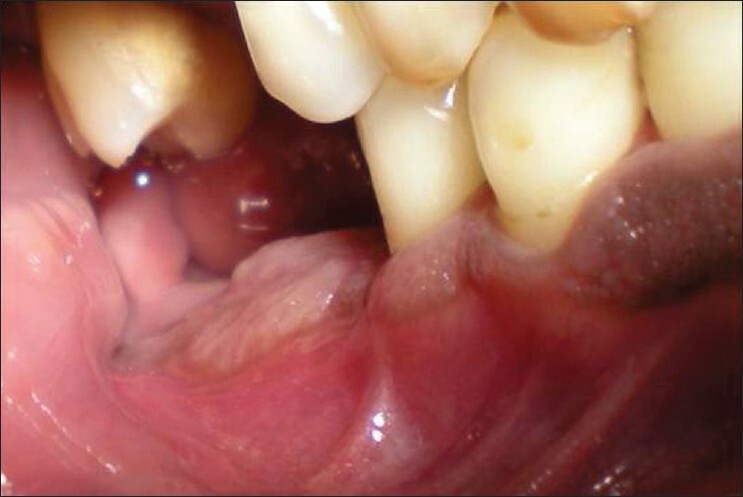 Gusenbauer et al., in a case report of primary lymphoma of the mandible, emphasized that malignant lymphoma must be considered in the differential diagnosis of unexplained dental pain and swelling. Bertolotto et al. have reported a case of primary lymphoma of the mandible with diffuse widening of the mandibular canal. There are no pathognomonic radiographic findings. Features are usually that of non-specific osteolysis. Usually, biopsy is carried out in the non-healing extraction site after repeated treatment for non-responding odontogenic infection. Histopathology usually shows sheets of chronic inflammatory cells, especially lymphocytes, mimicking an inflammatory reaction. Careful examination by an expert histopathologist is necessary to find out the pleomorphic and atypical lymphoid cells. In our case, the histopathology showed sheets of lymphoid cells infiltrating the bone, with atypical mitotic figures, areas of sclerosis, necrosis and hemorrhage. 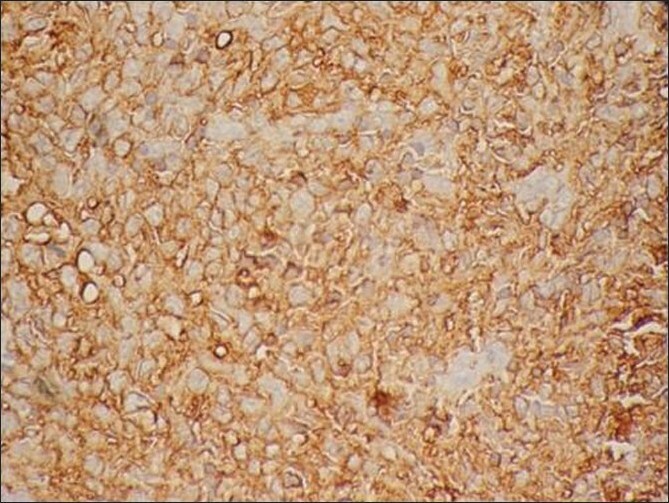 Lymphoma was suspected and immunohistochemistry was performed for the following markers: LCA (CD45), CD15, CD20, CD30, PAN-CK, EMA, ALK1 and CD3. The result was positive for LCA (CD45) [Figure 5] and CD20 [Figure 6]. Therefore, based on the immunohistochemistry profile, a diagnosis of non-Hodgkin's lymphoma was made. When tissue diagnosis is confirmed as NHL of the mandible, determination must be made regarding orientation and spread of tumor. Overall assessment is essential to rule out nodal and visceral involvement. A CT scan and Positron emission tomography (PET) scan can be carried out to look out for extranodal involvement. Laboratory studies are not specific, although elevated lactate dehydrogenase is observed as a poor diagnostic factor. In our case, we ruled out any other site involvement with a general physician. Investigations like hemogram, radiograph and CT scan were performed. Lymphoma of bone should be considered in the differential diagnosis of long-standing, non-healing extraction wound. The authors would like to acknowledge the help of Dr. J. M. Jeyraj, Principal, Sri Ramakrishna Dental College and Hospital, Coimbatore. 1. Boulaadas M, Benazzou S, Sefiani S, Nazih N, Essakalli L, Kzadri M. Primary extranodal non-Hodgkin's lymphoma of the oral cavity. J Craniofac Surg 2008;19:1183-5. 2. Longo F, De Maria G, Esposito P, Califano L. Primary non-hodgkin's lymphoma of mandible; a case report. Int J Oral Maxillofac Surg 2004;33:801-3. 3. Freeman C, Berg JW, Cutler SJ. Occurrence and prognosis of extranodal lymphomas. Cancer 1972;29:252-60. 4. Temmim L, Baker H, Amanguno H, Madda JP, Sinowatz F. Clinicopathological features of extranodal lymphomas. Oncology 2004;67:382-9. 5. 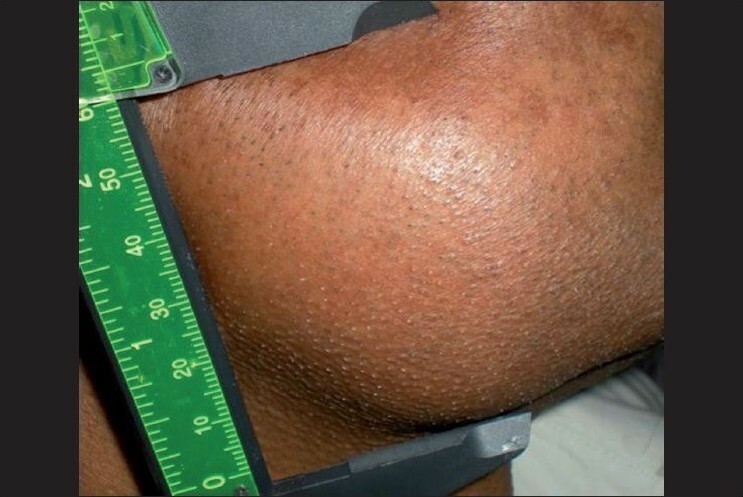 Rahmat K. Primary bone lymphoma - a case report with multifocal skeletal involvement. Biomed Imaging Interv J 2008;3:e52. 6. Beal K, Allen L, Yahalom J. Primary bone lymphoma. Cancer 2006;106:2652-6. 7. Sarda AK, Kannan R, Gupta A, Mahajan V, Jain PK, Prasad S, et al. Isolated non-hodgkin's lymphoma of the mandible. J Postgrad Med 2006;42:187-9. 8. Parrington SJ, Punnia-Moorthy A. Primary non-hodgkin's lymphoma of the mandible presenting following tooth extraction. Br Dent J 1997;187:468-70. 9. Djavanmardi L, Oprean N, Alantar A, Bousetta K, Princ G. Malignant non-hodgkin's lymphoma of the jaws - a review of 16 cases. J Craniomaxillofac Surg 2008;36:410-4. 10. Gusenbauer AW, Katsikeris NF, Brown A. Primary lymphoma of bone. J Oral Maxillofac Surg 1990;48:409-15. 11. Bertolotto M, Cecchini G, Martinoli C, Perrone R, Garlaschi G. Primary lymphoma of mandible with diffuse widening of the mandibular canal. Eur Radiol 1996;6:637-9. 12. van der Waal RI, Huijgens PC, van der Valk P, van der Waal I. Charecteristics of 40 primary extranodal non-hodgkin's lymphomas of the oral cavity in perspective of the new WHO classification and international prognostic index. Int J Oral Maxillofac Surg 2005;34:391-5. 13. Mawardi H, Cutler C, Treister N. Medical management update: non-hodgkin's lymphoma. Oral Surg Oral Med Oral Pathol Oral Radiol Endod 2009;107:e19-e33. 14. Bachaud JM, Coppin D, Douchez J, Boutault F, Paty E, Saboye J, et al. Primary malignant lymphoma of the mandible; a studyof 3 cases and review of literature. Rev Stomatol Chir Maxillofac 1992;93:372-6.